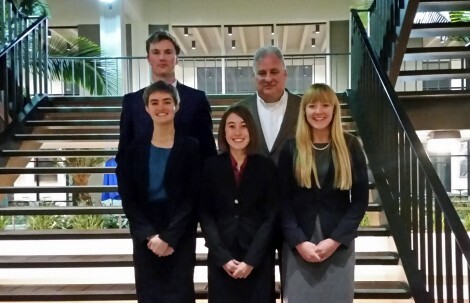 Four Ohio Wesleyan students participated in the national moot court championship this month in California. Participating were (front row, from left) Chloe Dyer, Katherine Berger, and Rhiannon Herbert, and (back row) Forest Dearing with coach Michael Esler. DELAWARE, Ohio – When the final verdict was handed down, Ohio Wesleyan University seniors Katherine Berger and Rhiannon Herbert earned an OWU-record-setting, Top-5 finish in the American Collegiate Moot Court Association’s national championship. The two future lawyers broke their own school record in the tournament, held earlier this month in Long Beach, California. “This team is used to winning,” said pre-law advisor Michael Esler, Ph.D., coach of OWU’s moot court team. So, he said, it was surprising when they won only three of six ballots in their preliminary competition – the minimum required to move forward. “The adrenaline that you feel when you are standing in front of established legal professionals and being battered with questions, yet have the confidence that you know the answers and can hold your own, is incredible, said Berger, a resident of Sunbury, Ohio, who will pursue a future career as litigator at the trial or appellate level. Herbert, who began competing as a junior, said the competition has significantly sharpened her public-speaking skills and her overall comfort in being in front of an audience. “The most rewarding part of moot court is seeing all of the hard work you have poured into your outline and preparation pay off when you win a round against a team you didn't think you would beat,” said Herbert, a resident of Mentor, Ohio, who hopes to become a state prosecuting attorney. In addition to Berger and Herbert, Ohio Wesleyan junior Forest Dearing of Louisville, Kentucky, and sophomore Chloe Dyer of Guysville, Ohio, also advanced from regional competition to the national finals. The American Collegiate Moot Court Association is the premier moot court competition for undergraduates, Esler said, simulating an appellate court hearing in which teams of two “attorneys” argue constitutional issues before a panel of lawyers and judges who portray Supreme Court justices. This year’s issues involved the free exercise of religion and equal protection rights of undocumented persons in the country illegally. To learn more about Ohio Wesleyan’s moot court program, contact Esler at mvesler@owu.edu, or visit www.owu.edu to learn more about the university’s Department of Politics and Government or pre-law major.